Carriers across America have discovered the Sliding Systems secret for more profitable hauls and backhauls: one word, Curtainsides. No more waiting at your customers for an open loading dock, your driver can simply pull in the destination yard and let the lift truck do the work. If you have ever paid a Worker's Compensation claim for "tarping", you can now reduce that risk. With a Curtainside trailer or van, loading and unloading your valuable cargo is as easy as opening your closet at home. 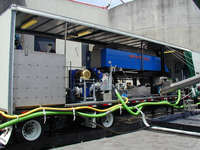 Sliding Systems, Inc. is the premier source of Curtainside Technology for all of North America. SSI offers all the advanced designs of trailers, vans and other specialty equipment used by the primary carriers of Europe. Lift a handle, unbuckle some straps, and you have entry to the entire side of a trailer in a matter of seconds. The exclusive SSI "Quick Closure" is durable and will protect curtain life, and is easy to operate. The versatile and exclusive "Versa Rail" is the upper curtain rail designed for little deflection, and the assurance of smooth curtain operation for the life of the Curtainside unit. This advanced curtain rail uses specially designed roof bows to offer a secure, no leak, sealing roof. The SSI "Rolling Post" roof support stays securely in the upper rail, and rolls to either end while loading or unloading. Since it never leaves the rail, it will last for the life of the curtainside unit, and offer you increased safety and durability. 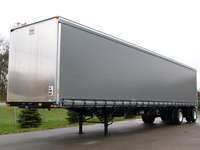 Our standard model Curtainsides (CS) system can offer you a better solution for your freight hauling needs. Maintain all of the flexibility of loading and unloading with a flatbed without the tarping and the wasted time and driver injuries that go with it. 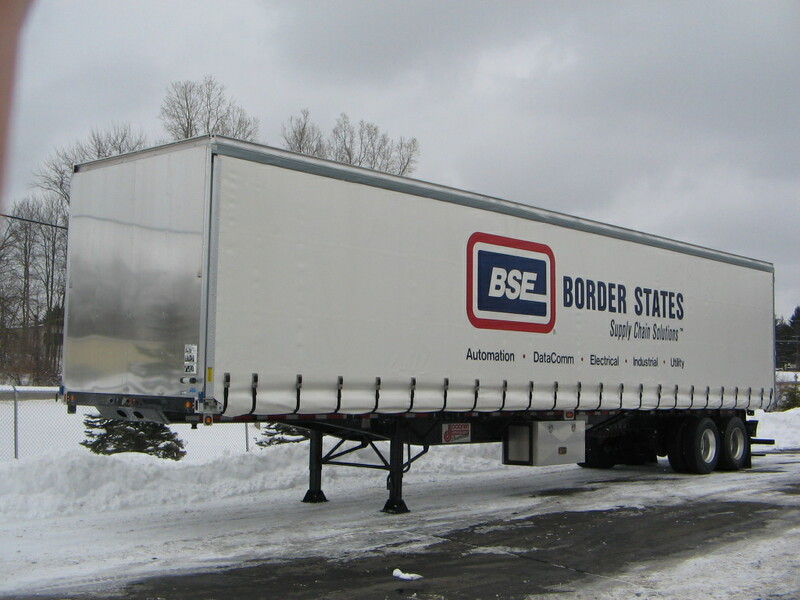 The versatility of SSI makes it a perfect system for just-in-time delivery, multiple local deliveries, and long hauls...and especially in nasty weather. Our systems have proved over the years to last long and provide low maintainence costs. 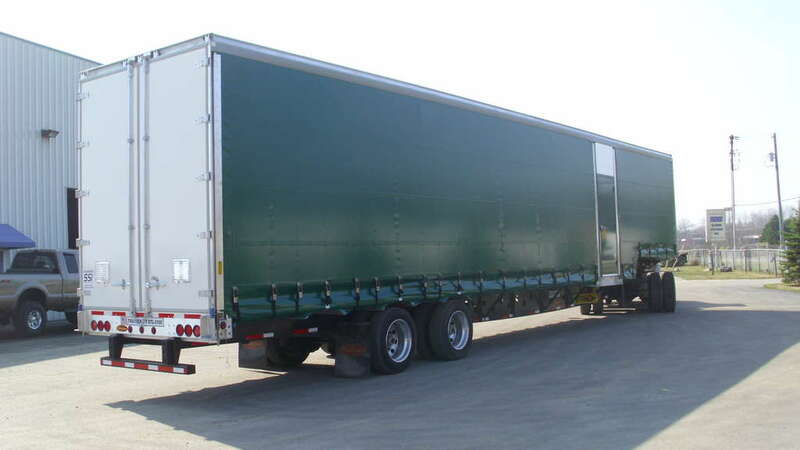 We have curtainside trailers that have logged more than a million miles on them. There are customers that constantly run our systems several thousand miles a month! If you are looking for a system to depend on haul after haul and you want your money's worth, look no further. SSI can help you. Our customers have reported that their employees are showing up early just so they can grab a Sliding Systems Curtainside before their co-workers do! Productivity is a key to success. Why equip your employees with something that is cumbersome? 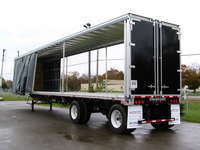 You need a Sliding Systems Curtainside. Ever since we began artwork on our Curtainsides several years ago, this option has been very popular. Why not use your curtainside to be an advertising tool? Imagine a rolling billboard that goes with you where ever you go. It will prove to be a wise investment. Our artwork department will work closely with your company to create your logo, if you don't already have one. We will work with you to custom-design a system to meet your needs. CAD drawings will be furnished for your approval before manufacturing begins. Wouldn't it be great if in a matter of seconds you could expose your trailer to be loaded like a flatbed, and then close it up and haul it down the road like a van? 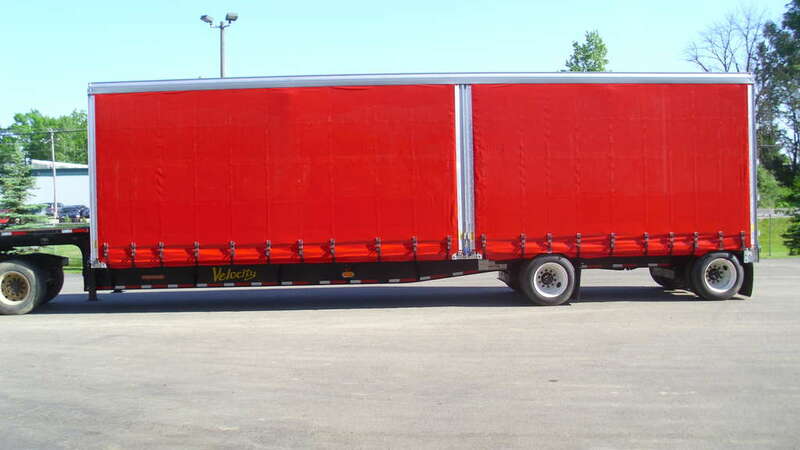 Click on the Gallery tab below for more Curtainside examples. How often does your trailer and driver have to wait for an available dock to load or unload? The lack of dock space is a large problem for "Just in Time" deliveries. A big advantage of the Curtainside is that it can be loaded or unloaded from both sides. 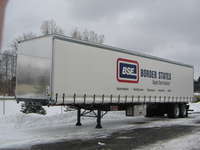 In inclement weather the Curtainside can be unloaded inside the warehouse with a lift truck. Continuous loading docks inside the plant make it possible to unload on one side, while loading on the other side. Our fabrication facility in Haslett, Michigan services the entire Midwest region and transportation companies throughout the United States. Our Curtainside fabrication facility is 36,800 square feet. 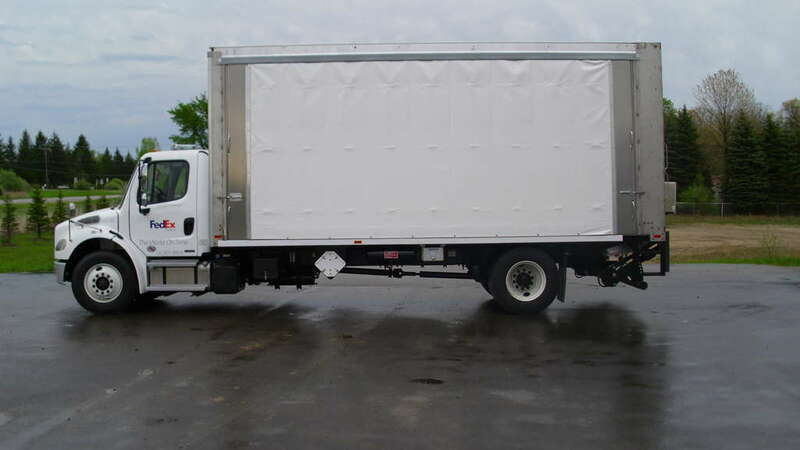 We manufacture all aluminum Curtainside trailers, box trucks, kits, provide custom artwork on curtains and exterior doors, repair damaged units, and develop new applications all under one roof. 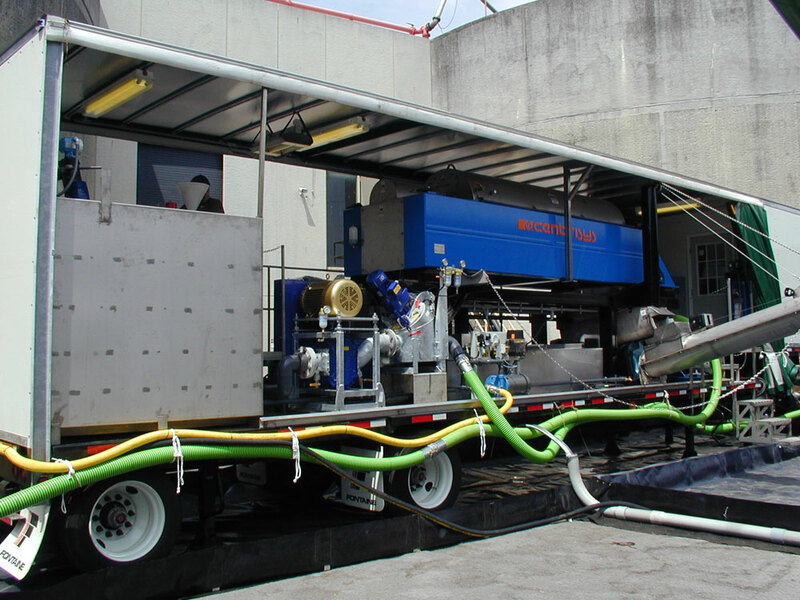 SSI is continually investing in new tools and equipment, so that production capabilities can increase and expand. We develop new applications and different designs all the time. Contact Sliding Systems for your specialty design applications and ideas. We welcome the opportunity to talk with you about new ideas.